If you ever feel as though you’re becoming the model of some quality or character trait, be careful. The world has a way of reminding you that you have much to learn. At least that is my experience. I’ve learned much in the last year about how to let go – to stop fighting and surrender. I felt like I was starting to get it. For a freelancing project I’ve been working on, one of my roles is a middle man between my client and another party. The day before our intended launch a few issues come up – missing information and technical problems. Meeting the deadline looks unlikely. We’ve been working hard on the project, and everyone involved is excited about the launch. But now I have to go back on my word, and it’s my fault we’re not going to. I didn’t give enough allowance for last minute issues. Now I am about to disappoint my clients. My mind runs through the worst case scenarios. I worry my clients are going to think less of me. I panic about not being able to do anything. The situation is out of my control. I am powerless. I sit, staring blankly at the ceiling. All is lost. The world is going to end – or at least my part of it. As I sit, I attempt to use logic to change my reaction. I point out that I’ve spent the last year learning how to let go. I observe that I wrote a post on surrender only a few weeks earlier. I note how the circumstances are beyond my control. I write a poem about how control is just an illusion. I argue that worrying will not change anything. I tell myself that these things happen, and I just need to roll with it. I remember that people are gracious and understanding – my clients especially. I show how my response is an overreaction to the circumstances. I highlight several options for constructive responses – each far better than what I’m doing right now. In my head, I agree with each of these arguments. The logic lines up. It makes sense. But that changes nothing. I still stare into space. I still hold on to the worry. And so my logic fails me. The body is pretty good at dealing with stress. It can supply you with the energy you need to push through and persevere. But if you go too long – if you neglect it’s subtle cues and warnings – your body will force you to stop. So it is for me. Weakened by my worry, my body decides it’s had enough. It succumbs to a cold – a bad one at that. I feel as though I have a massive sneeze coming on. But instead of ending with relief, the congestion just stays. Eyes tear. Pressure builds. My throat goes dry. Frustrated, I try and force myself to ignore the discomfort. I stare intently at the ceiling. I hit my head against the wall. Side note: this is not a good idea. I tell myself to stop complaining. Nothing seems to work. No matter how hard I try to disregard the sickness and stay positive, I struggle. Physical weakness creates mental weakness. It’s hard enough to fight using willpower when in full health. Being sick makes it near impossible. And so my willpower fails me. In each situation, I fail to surrender. I am unable to let go. It’s obvious to me that I need better systems to deal with and manage such stress. I need to create better habits of surrender. Peaceful music playing, I go to the kitchen. Turn the kettle on. Get out the scale. Measure the freshest of coffee beans into my grinder. Twist the handle. Twist the handle, each rotation sending grains of coffee into the container below. Keep grinding. Spin to the music. Spin to the rotation of the handle. The water’s boiled. The coffee’s ground. Ready to brew. Pour the fresh water over the grounds. Set the timer. Wait patiently. Decant coffee into a clean, white mug. Take the mug and go to the bedroom. Sit on the puffy blue cushions next to the window. Look at the snow outside. Raising the drink to my lips, I sip. Warmth floods into me. The song starts over again. My thoughts focus on the notes – and only the notes. I draw deep breaths. Slower. Slower. Slower. The noise in my head quiets. Meditation – the brewing and drinking of my coffee – brings calm. Bundled up in my coat, I go outside. Walk out the front door. Head toward the lake. Stop to pick up a bunch of snow. Pack it into a snowball. Rub gloves across the surface, smoothing it to perfection. Toss it at a tree. Watch it explode into a shower of falling snow. Pick up more snow and start over again. Pause to pet the dog, who wags her tail with delight. Laugh as she chases a ball across the field, skidding on an icy patch. Share in her joy. Look at the patterns of ice on the lake-shore. 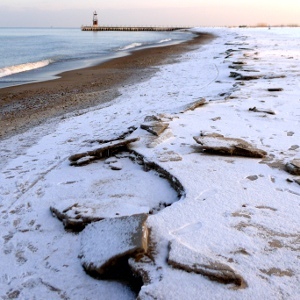 Admire nature’s sculptures of sand and ice. My legs move. My body loosens. I inhale the clear air and exhale my stress into the wind. Maybe I don’t need to develop new systems and structures. Perhaps I don’t need to learn new tactics and strategies. I have all that I need already. I just need to use what I already know. The surrounding circumstances don’t change right away, but through meditation and walking I am better able to handle them. I’m not quite so grumpy. I even make a joke from time to time. The project turns out fine. We push back the deadline, and everyone involved is satisfied with the decision. And thanks to the wonders of modern medicine, I begin to feel better again. What about you? What rituals help you let go? PHOTO: A lovely place to go walking. Chicago, IL. Back when I was serious about my daily walk (meaning it happened twice a week instead of never) it was my surrender ritual. I haven’t thought about it much of late, so I think I’ll put “investigate healthy rituals” on my think-list. Resonates with me that your solution was not logical, but going to a place of emotional peace. My way to recharge is to talk to my groups, like the book club. You are one of the people who help me recharge! Joel, I find rituals can provide a nice shortcut to the emotions you want. They bypass the irrationality of worry. Frances, Happy to help. 🙂 And speaking of that, helping people is another effective way of finding peace. That was a gripping post, Joshua. I couldn’t stop reading. So deep and compelling. It’s amazing how writing about the tiniest details takes your mind into a different place. I loved how you took us on your emotional roller coaster with you. I’m exhausted too. Many times in life and especially when God is taking me through a new dimension of transformation, I feel being in a box of not letting go. I whisper to myself accept you power has come to an end so ‘ LET GO, LET GOD’ I feel refreshed, renewed and ready to face on. Josh, it is not easy the process but it happens. Emotions released, we get refreshed I think. It heals and revives. Josephine, In a way, you can gain control when you let go. You gain renewal, refreshment, and healing (as you mention), and have more ability to create and react to the situation. Next Next post: Have You Ever Noticed?